The ASVAB or Armed Services Vocational Aptitude Battery is a test taken by anyone who is enlisting for the military. The purpose of the test is to make sure each applicant is qualified for military involvement and to also dictate an appropriate job for you upon acceptance into your military branch. Each applicant into any military branch is required to take the ASVAB. Once you have completed the first step in the enlistment process and are approved to proceed, your recruiter will schedule you to take the battery at a testing site near to you. There is no fee to take the test. Most ASVAB testing takes places at a Military Entrance Processing Station, commonly referred to as MEPS. These are located throughout the U.S. and Puerto Rico at 65 sites. However, it is possible that you do not live very near to one of these. If that is the case, you may be scheduled to take the battery at a MET site or Military Entrance Test site. All testing at a MEPS is done by computer. If you are testing at a MET site, you will most likely be conducting the ASVAB with paper and pencil. Whether you are taking the battery using a computer or with paper and pencil you will not need any materials or personal items to test successfully. Calculators are included in this and are not allowed to be brought. However, you are required to bring a valid government issued identification with you to your testing site. It is important that you are not late for your scheduled exam as well. If you are tardy, you will not be allowed to take the ASVAB that day and will have to reschedule. The battery is made of 10 subtests with a total of 135 scored questions. It is important to note that two to four subtests or sections of the ASVAB are allowed to contain tryout questions. These are not scored but are used to make sure your scores are appropriate to your testing level. There can be as many as 15 of these questions in one subtest or section. With the CAT ASVAB, you will work at your own pace. When you finish a test or subtest, you are able to move on to the next without waiting for instruction or anyone else to finish. This may allow you to finish the exam much earlier than the two hours you are typically given. However, with the paper and pencil form of the ASVAB, you must wait until you are instructed before moving on to the next sections. The Paragraph Comprehension subtest is part of the Verbal domain. This section gauges how well you are able to understand and comprehend passages that you read. You will read passages and then answer questions based on the information in the content. You will not be tested on your prior knowledge of the subject that is written about, just what is contained in each passage and what it means. It is made up of 11 scored questions, with the possibility of 15 extra tryout questions. You will be given a total of 22 minutes to finish this subtest. However, if there are any tryout questions you will be notified of a longer time, typically double the original amount of time. The CAT ASVAB is scored onsite upon its completion. You will immediately be given your scores there. However, if you have tested using paper and pencil, your test will have to be sent to MEPS to be scored. Your recruiter will then be notified when your results are available. 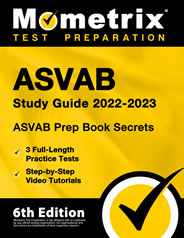 Mometrix has designed an ASVAB Study Guide and a set of ASVAB flash cards to help you prepare for each subtest of this battery/exam. They are easy to follow and learn from and will give you a reasonable idea of what is to be expected from you on testing day. Both are designed to give you sample questions that may or may not be on the actual ASVAB and are even worded accordingly so that you really get a good feel for the upcoming battery. 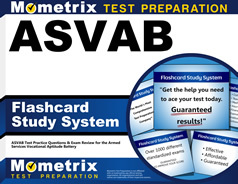 Make sure to get your hands on both the ASVAB Paragraph Comprehension study guide and the ASVAB Paragraph Comprehension flash cards to make the most out of this testing experience.